Canine Hip Dysplasia (CHD) is the most common inherited orthopedic problem seen in dogs. Simply put, the hip is a ball and socket joint. Dogs with hip dysplasia have developed a ball and socket that don’t fit properly. Instead of gliding smoothly over one another, they rub and grind. Over time the joint will deteriorate and ultimately this can lead to the loss of joint function. 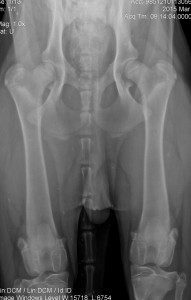 Hip Dysplasia affects all breeds, although can be more problematic in large and giant breeds. It has been demonstrated that dogs with more laxity in their hip joints are at a higher risk of developing Degenerative Joint Disease, arthritis, which is typically accepted as a confirmation of CHD. The disease can manifest in 2 main ways. The first is the severe form that affects young animals. It presents as severe pain and lameness. The second form has as a gradual onset that progresses with age. It manifests as mild, intermittent pain, decreased range of motion and stiffness. It may often go unrecognized, or mistakenly thought of as normal aging changes. 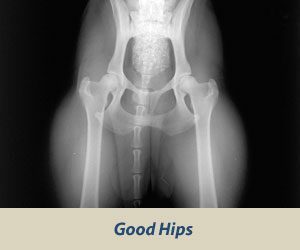 Our traditional ways of evaluating the health of the hip joint is a dog has been by taking a single view radiographs in an extended position. 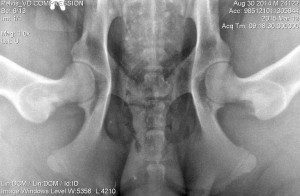 While this view will detect arthritic changes, it can give one the false impression of joint tightness and it doe nothing to reliably distinguished between normal and disease prone hips when arthritis is not present. This procedure can be done preliminarily at any age, however, an official reading can not be taken until 2 years of age. The PennHip procedure involves taking 3 radiographs views; and extended view, a compressed view and a distracted view, in a fully relaxed patient by a certified PennHip Veterinarian. This will allow for assessment of the passive laxity of the hips, which is measured as the Distraction Index(DI) between 0 and 1. (0 being very tight hips and low joint laxity = low risk of CHD and 1 being very loose hips and high joint laxity = high risk of CHD). This is the only procedure available that will give a measurement of laxity! This procedure can be done as early as 16 weeks of age. The procedure is very safe, but does require sedation or general anesthesia to allow complete relaxation of the hip musculature. Typically, the procedure is non-painful. However, if there is underlying arthritis already, there may be a little discomfort after hip manipulation, which is usually managed with an oral pain medication. 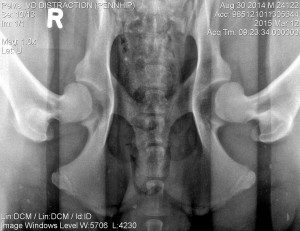 Breeders: Hip Dysplasia in an inherited condition. To attempt to eliminate this genetic problem from a breed, we would only mate dogs with lower DI than the mean for that breed. Working /Service dogs: There is a great deal of time and money that is put forth to developing and training working dogs. Dogs that have a very high DI (very loose hips) are not ideal candidates for investing the specialized resources for these jobs. Owners: If we know early on that a dog is at a higher risk of developing Hip Dysplasia, we can more strictly monitor weight, muscle mass and implement nutraceuticals or other therapies to help keep the clinical manifestation at bay. And because PennHip can be done as early as 16 weeks of age, there is a corrective procedure that can be attempted to improve the hip laxity if done before 4 to 6 months of age.